A young leopard that strayed into the Suzuki Powertrain at Manesar in Haryana early on Thursday was rescued unhurt on Friday, after which work resumed at the engine plant of the car major. Four teams of Wildlife and Forest officials who had reached the plant on Thursday trapped the big cat with a tranquillizer. "It will be freed after medical examination," said a member of the rescue party. The animal was caught around 2.20 p.m., nearly 36 hours after it was spotted in the factory by a guard. "Work has now resumed in the engine plant," said a worker union leader. Earlier, two goats placed inside a cage to woo the leopard were replaced by red meat as the goats failed to attract the wildcat. Around 50 Rapid Action Force men were also pressed into service to assist the rescue team. The animal entered the premises of Suzuki Powertrain India Ltd in Sector 8 (Phase 1) of Tau Devilal Industrial Model Township at Manesar on the Delhi-Jaipur-Mumbai highway. The factory immediately halted production and hundreds of workers poured out fearing attacks by the leopard. 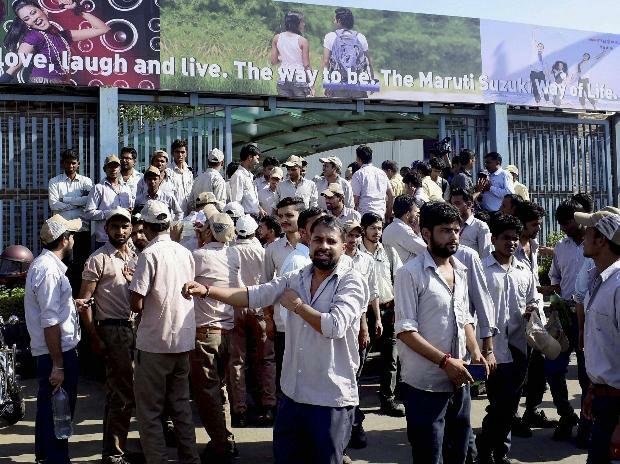 The plant, spread over 750 acres in the foothills of the Aravali mountain range, makes diesel engines for Maruti Suzuki India Ltd cars.